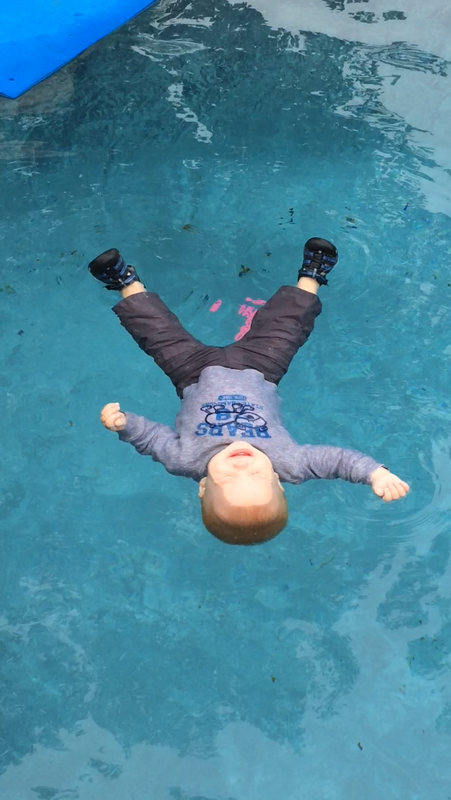 Today, after five weeks of four day/week ten minute swim lessons, Rex has mastered the craft of floating in a body of water wearing clothes, shoes, and a regular diaper! I know it looks a bit extreme, but he still enjoys the water even though these clips I am about to share might make you think otherwise. Landri has also been trained in this skill (see older post here). While I do feel much better that both kids have this technique under their belts, there is still no replacement for adult supervision when it comes to water safety. No child is drown-proof no matter what alarms/skills/etc are in place!!! Here’s Rex rolling over to float and here’s another clip of him floating (he can do this for at least 1.5 minutes if not much longer). Also, I would note that although his cries will tug or strongly yank your heartstrings, LOL, the fact that he screams is actually preferable as it serves as a loud alert when/if he does fall into a pool or other body of water. My metta wish for you is that all of the children in your lives have a fun and SAFE summer of water play this year and always! Previous Post Rex is Definitely a Boy!